Award-winning promotion turns Health Alert into the fastest-growing newsletter in its class! 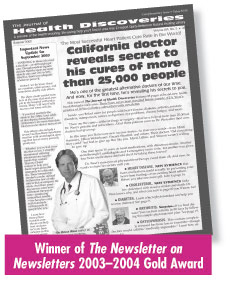 Dr. Bruce West’s Health Alert, a successful, respected newsletter for many years, faced an uphill marketing challenge. Health newsletter circulations were down over 55% in the past 3 years. Conversely, the total number of health newsletters had more than tripled in the last 10 years to over 50. To make matters worse, the majority of competing newsletters used the same size magalog-style promotion, so prospective subscribers had trouble telling the many publications apart. This caused overall response rates to decline more than 50%. Obviously, this made it difficult to achieve success. First, to break out from the sea of magalog-size promotions, CDMG chose a tabloid-size format that would stand out from other mail. This size also enabled the use of large, friendly type, and clear diagrams and illustrations. Emphasizing the healing power of “phytonutrients,” something not discussed by any other publications, “you”-oriented copy was developed. The copy targeted common illnesses and positioned phytonutrients as the cure. Numerous testimonials and real-life examples were strategically placed throughout. Sidebars were presented on a yellow-lined background, giving the piece an educational, “note-taking” look and feel. The call-to-action included an introductory subscription discount, along with a valuable, free offer of a healing resource series called Dr. West’s Quick-Reference Natural Healing Library. Despite intense competition during a time when other subscriber bases had declined, the Health Alert subscriber base grew by over 20%! The results were 176% over both breakeven and projection. Due to the remarkable success of this direct mail package, CDMG won The Gold Award for best news-letter promotion from The Newsletter on Newsletters 2003–2004 Awards Competition.